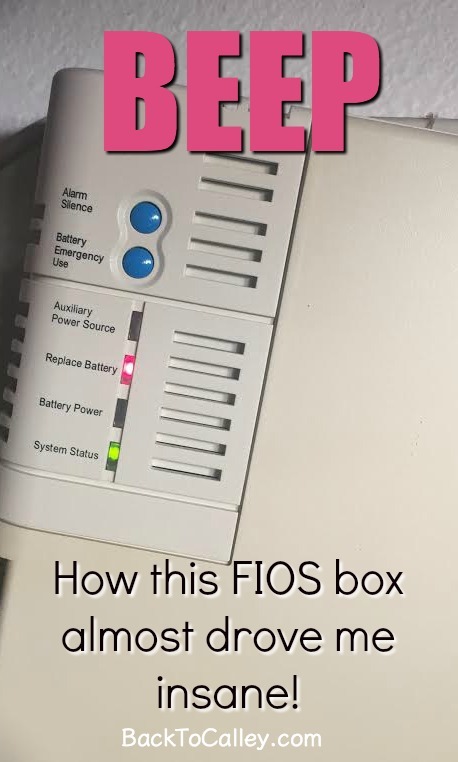 How this FIOS box almost drove me insane! Tuesday, early in the day: Noticed a random single beep every 20-ish minutes in the house. Kept working, no clue what’s causing it. Continue working and try to ignore it. Hours have passed by now and it’s time for dinner. Leave the house for dinner and hope it’s stopped when I get home. Come home from dinner and check in at work. Realize after about an hour that it’s still beeping. It’s not a loud beep, it sounds like the kind of beep an iron makes when you leave it plugged in too long. Decide to do a live Facebook chat for work. Chat for 1 hour (and 7 minutes to be exact) and notice the beeping 2-3 times during my chat. Mention the beeping to others during chat. End chat and start making notes on what time the beepings happen so I can track it. 10:39pm BEEP – Air Conditioner came on at the same time. Start making notes. Set timer for 14 minutes. 10:55pm Standing in the hallway between all 3 bedrooms and air conditioner. BEEP. Sounds like it’s in the kitchen! 11:09pm standing in the kitchen BEEP sounds like it’s in the back of the house (bedroom area again). 12:09am BEEP – sounded like my bedroom again. 12:24am BEEP (Standing in my bedroom) and now it sounds like it’s muffled. In the kids room or bathroom?? I’ve eliminated both smoke detectors. It’s not in my bedroom. It’s not in my kitchen, living room, dining room, or office. Could it be in the bathroom? Run to bathroom to see if it’s coming from there. 12:39am BEEP standing in the bathroom, sounds like it’s in the kitchen! I think I’m officially entering the 9th circle of Hell. I’ve already been to the kitchen! Post to Facebook. Watch the timer on my phone. Wonder who is filming this from outside my house laughing at me?? Wonder if it’s inside the walls of my house? 12:54am BEEP sitting inside my sons room with the door mostly closed. Sounds like it’s the farthest away yet. It’s so quiet that I can hear clocks ticking, dogs snorting, and my own breathes. 1:09am standing inside my closet thinking maybe my husband has a watch that’s beeping. BEEP – nope, not in closet! Still sounds like it’s in the walls!!! 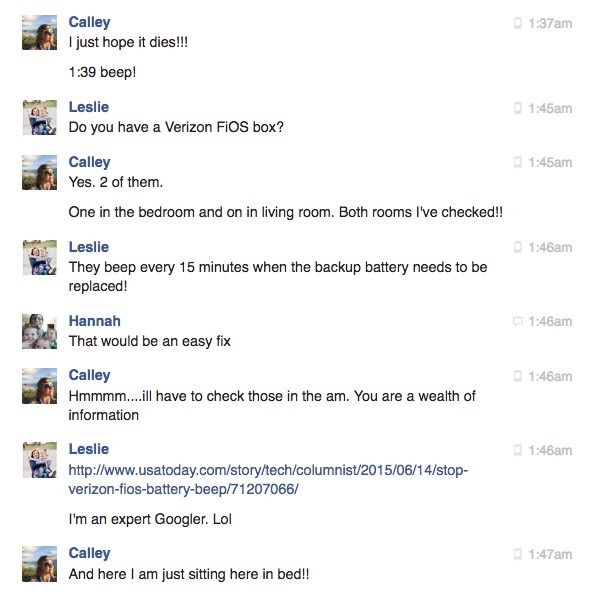 1:37am go back to my Facebook chat with friends before heading to bed. 2:00am decide that I’m going to go to sleep and hope that this BEEP doesn’t keep me from falling asleep. I did manage to get some sleep until around 7 when I hear it again – BEEP! Decide I’ll scroll through my Facebook feed and emails before investigating again. 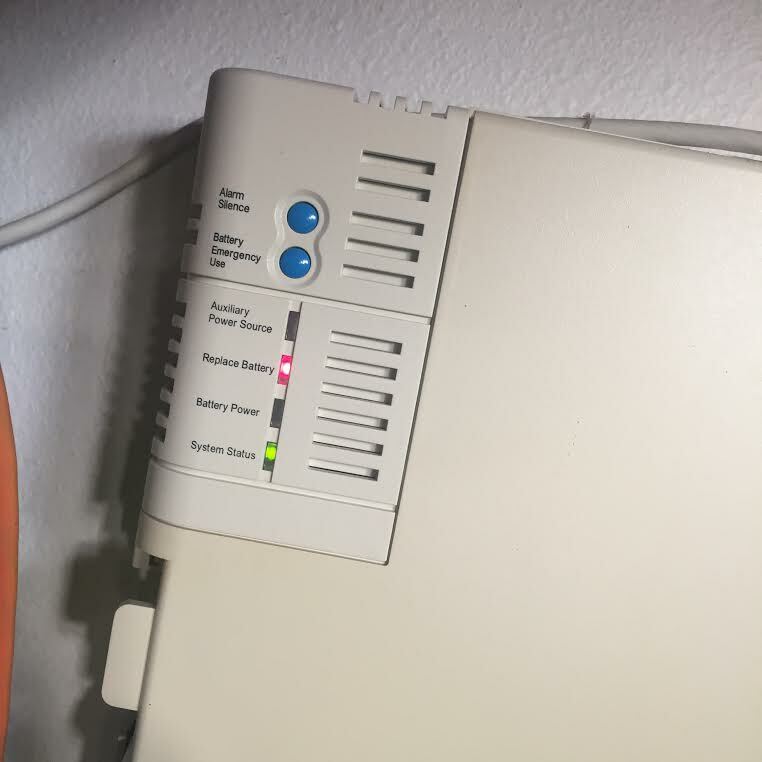 OMG – it totally is the FIOS box in the garage!!! …I should probably call Verizon (or Frontier…..no clue who I’m suppose to call now) and pray they can come replace the battery. Thank you FIOS for driving me to insanity with the random BEEP every 15 minutes. Leapin’ Lizards, Annie’s in Tampa – Feb 17-22nd at the Straz Center Sunsets in Winter Valspar Championship Fun Facts and Tips 2015 Floridians add what to their coffee?? Have you enrolled in Florida Prepaid yet?